I’m not one for gushing about a brand, well, not really, but this is a big exception. Murad has completely rejuvenated my love of skincare with products that work – no seriously, they really work. Their acne body care range (reviewed) for acne has seen almost every blocked pore, ingrown hair and blemish from my body disappear; I’ve been using their acne facial wipes as well which are amazing when you’re a bit too ‘gone’ shall we say, to wash your face when you get back from an evening out (review to follow). 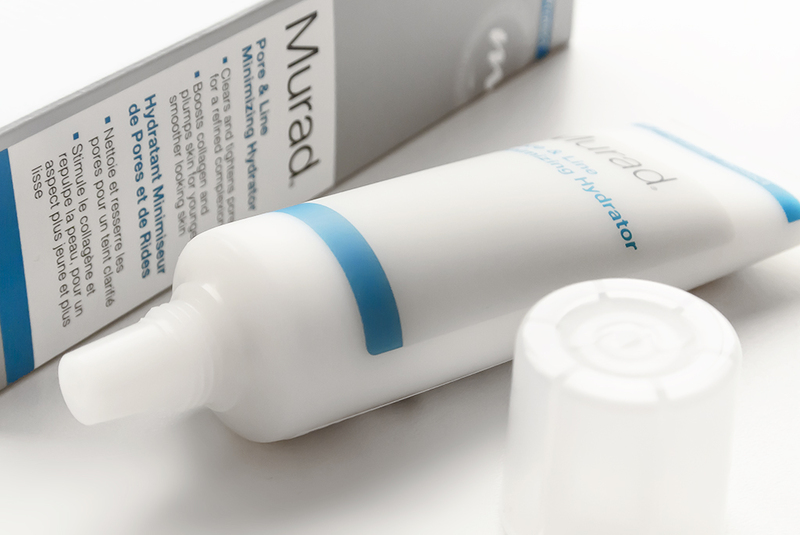 Murad Pore and Line Minimizing Hydrator uses three active complexes to reduce appearance of enlarged pores and lines/wrinkles whilst simultaneously hydrating the skin. Firstly Kombucha Collagen Defense® stimulates collagen production and inhibits its breakdown to smooth the appearance of fine lines and wrinkles. Lentil Seed Extract and Witch Hazel tighten pores and help control excess oil. Finally, Cinnamon Extract restores skin surface by reducing inflammation and optimizing oil production. Usually pore products feel too light and don’t usually hydrate as well as they promise, but this feels nourishing without loading the skin full of greasy oils, therefore, no-shine! It sinks into the skin and leaves it looking dewy, shine-free and feeling really comfortable. There’s a light fragrance and you can really tell there’s Witch Hazel in here. Throughout the day the skin remains hydrated and you won’t feel dry or gagging for moisture, even later on. Oh finally, you only need the tiniest amount; a little goes a very long way. Murad Pore and Line Minimizing Hydrator is available for £36.60 from Look Fantastic, saving 28% off the RRP with free-delivery. Also they have 12% off for new customers by entering the code NEWBIE at the checkout. This article first appeared on MANFACE written by Thom Watson. It was published on Friday 20th December 2013 and was last updated on Monday 3rd April 2017 at 3:20pm. It's categorised under Acne, spots & blemishes, Anti-Ageing, Enlarged / Blocked Pores, Moisturise, Murad where you'll find more related content. Trying to say I’m fat Danielle!? How very dare you. Hahaha! Seriously, this is an awesome product, so pleased I discovered it.